Recommended Dosage: Infants and children up to 2 years old: Take one drop daily. Non-Medicinal Ingredients: Medium chain triglycerides (form coconut). I love that there is a year's worth in one bottle versus other brands! Easy to give to my daughter. 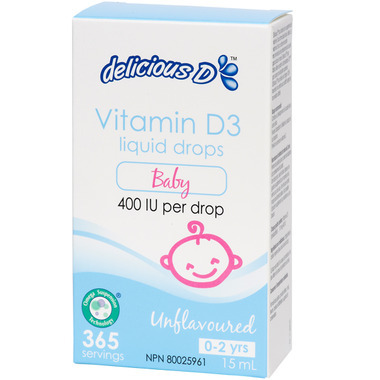 Only vitamin D drops I can get my daughter to take easily and that I feel good about giving her. Would definitely recommend! I love these drops, I use them everyday in my son's night time bottle. I really like that they are unflavoured. No additives, little flavour, easy to use. Great product. Great product and good value. Just one drop does the job. Great product. Easy to use (1 drop per day) and baby doesn't mind it at all. Would purchase again and again. A favourite!